Spending my Christmas and New Year holiday on a remote tropical island has always been a dream of mine. But to spend it on an island in the middle of a lake, which is on another bigger island surrounded by ocean? Visiting Sumatra is more than I could have ever dreamt of! 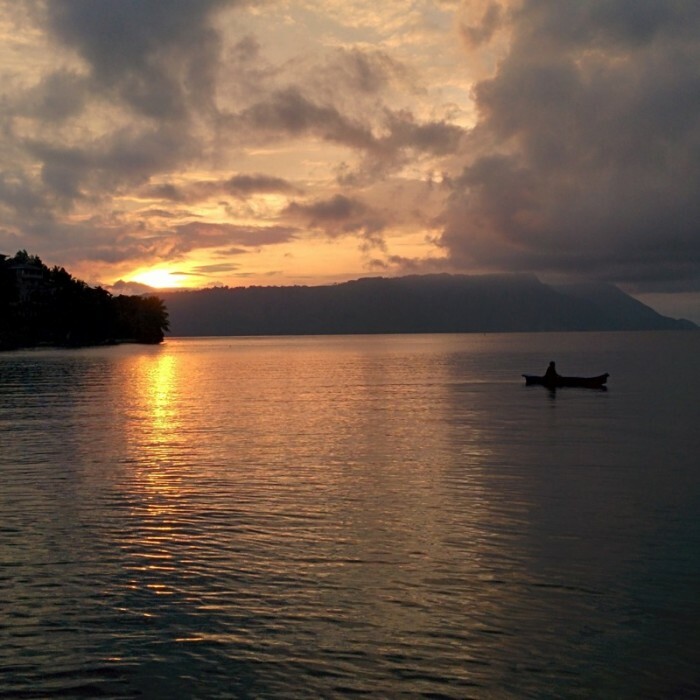 Lake Toba is a must visit when considering fun things to do in Indonesia, and is situated on it’s biggest island – Sumatra. Lake Toba is the biggest volcanic lake in the world and at 450m, one of the deepest lakes too. The island inside the lake is called Samosir and is roughly the same size of Singapore (to put things to scale). The island, as well as the rest of Sumatra is much less developed than most other tourist regions in South-East Asia. And while travelling here is a little more difficult, with a little planning you can be sure to enjoy the lake and surrounding volcanic mountains, which are a sight for sore eyes. The island is home mostly to Batak people who tend to be Christian and have a unique building style. Wooden houses raised off the ground with high pointed roofs to catch the summer winds while keeping the monsoon rains out are characteristic of this region. The back of the roof is usually higher than the front and signifies that the parents want their children to reach higher than them in their lives. More notably, there are also a fair amount of churches (rare for such a Muslim country). The people were friendly but we were mostly left to ourselves. No one was trying to sell us souvenirs or handicrafts, or directing us to tourist spots. A welcomed break from say, the tourism of Thailand. When we did interact with local residents we did find a communication barrier, so bringing a English – Indonesian travel dictionary would have really helped us understand each other. Especially when our motorbike broke down, or when our bicycle got a flat tire, or when we got lost! The peninsula of Tuk-Tuk on Samosir island is where almost all the guest houses and hotels are, as well as restaurants and bike rental places. It looks similar to other backpacker tourist areas in Asia (many places offering western breakfast like banana pancakes). But once you leave the area of Tuk-Tuk you are rewarded with stunning mountainous scenery, staggered rice paddies and dense jungle. We rented a motorbike the first few days and were continuously unlucky with rain. The third day we agreed to ignore it and after a mere half an hour of rain the sun came out and showed us the true, breathtaking beauty of Lake Toba! 1. Rain Jacket and Day pack or Dry bag – December is known for more rain than the rest of the year. An umbrella of plastic raincoat is not enough, prepare for heavy downpours that will find it’s way to your camera in seconds. Get dry bags and keep documents, money and a spare (dry) t-shirt in there for when the rain finishes and the sun returns. 2. Trekking sandals (men, women) – To do scenic hikes around. 3. Sunblock for face and body – You wouldn’t want to have burns! 4. Camera – With stunning scenery get the best camera you can afford. A smart phone just won’t capture it! 5. Go Pro camera and head mount – If you don’t want to buy an expensive camera then a Go Pro will help you capture those awesome moments during biking, at the top of the volcano or in the lake! 6. Monopod – To make selfie! 7. Portable charger (small, medium and large) – May be useful if you’re going to hike for the whole day. 8. Swim suit – yes! you can swim in the lake. 9. Mosquito repellant – the local versions don’t work well enough! 10. Cash – bring enough money for your whole time on the island as there are no ATM’s. If you do run out then you will have to take a day ferry across to the mainland and then back again! 13. Snacks – While there is more than enough food on the island remember everything is bought from the mainland. So if you like snacks it’s cheaper to bring some with you. 14. Antibacterial wipes. There isn’t really a doctor or pharmacy on the island so bring the ‘just in case’ items. 15. Motion sickness gummies or pills – The boat ride can be pretty choppy and if you don’t manage to get a seat you will be swaying with the boat! 16. Torch – there were a few power cuts so having a torch was possibly the most useful item we brought (the candles in the guesthouse got wet in the rain).